Getting started in the hobby of astronomy can seem overwhelming. I mean, it is the study of the Universe! That's a pretty staggering concept. There is so much to learn; constellations, the motions of the stars, Sun, Moon, planets, just getting the names and pronunciations right can be tough without some good help, or a mentor. Most observers start out in just about that order, it's a natural progression. Once they've learned their way around the sky and can name many of the bright stars and constellations they gravitate towards the Moon and planets. 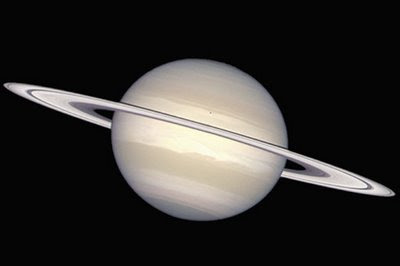 For many of us, that first magical look through a telescope at Saturn and her majestic ring system is all it takes to get us hooked for life. Soon after purchasing their first telescope, most amateur astronomers begin seeking out deep sky objects, like the Messier objects. Locating them and learning how to discern the subtle detail available in the eyepiece is a fun and rewarding experience. Most people find that adding to their understanding of the objects they observe adds to the enjoyment. Knowing that the planetary nebula you are looking is the gaseous remains of an old stars atmosphere, glowing in space due to the energy released by the white dwarf in its center makes them even more exciting to observe. Soon, reading astronomy books and magazines, even astronomy blogs!, becomes a regular activity. 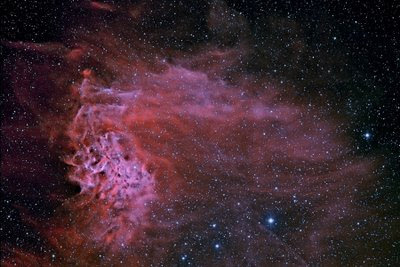 The variable star AE Aurigae is embedded in the Flaming Star Nebula, aka IC 405. For me, it was the things that changed from day to day, or even in the course of a few hours, that were always the most interesting things to observe. Watching sun spots rotate around the solar disk, tracking the changing orientation of the Galilean satellites from night to night, watching a prominent feature on Mars rotate out of sight and watching the Moon pass in front of a bright star or planet has always been the biggest thrill for me. Proof that the Universe was alive with motion and packed with action I could see with my own eyes or in a telescope. Many amateurs can continue on chasing after ever fainter, more elusive 'faint fuzzies', or spend the rest of their life perfecting the technique of obtaining the perfect image of a galaxy or star cluster, but for some, they reach a fork in the road, where they decide they want to actually contribute to science in some meaningful way. For many of these amateur scientists, variable star observing (VSO) provides the answer. Getting started in VSO presents many of the same challenges as starting out in general astronomy. You need to be able to find your way around the sky, learn the terminology, and learn how to get the most out of your equipment and what the limitations are. And just like other astronomical pursuits, its a lot more fun if you understand what it is you're looking at and why it is interesting to professional astroomers. 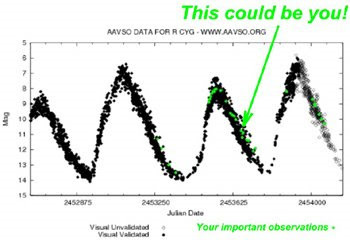 Fortunately, the AAVSO has a program for beginning observers, the AAVSO Mentor Program. The AAVSO has a long tradition of experienced observers helping new observers learn the ropes of VSO. Many of us can trace our knowledge back several generations to some of the most prolific and famous amateur observers of all time. 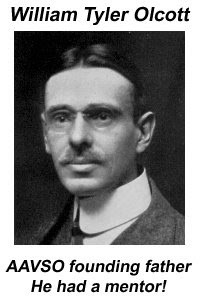 Even William Tyler Olcott, the founder of the AAVSO, started out by learning VSO from another observer. The mentor program has volunteer instructors in the US, Canada, Europe, South America and Australia. There are mentors for visual observers just stating out and knowledgeable amateurs who can teach you to use a CCD or photoelectric photometer. "...it is a fact that only by the observation of variable stars can the amateur turn his modest equipment to practical use, and further to any extent the pursuit of knowledge in its application to the noblest of sciences." If you'd like to turn your modest equipment to practical use observing variable stars, and want to get off to a good start, contact the AAVSO, or email me at mikesimonsen at aavso dot org to request a mentor to help get you started. The study of stars have their own fun because you will be feeling some thing others from normal human beings!